IIT Kanpur has released the information brochure for JEE Advanced 2018 on January 26. The brochure gives all the pertinent information about the exam in three sections – institutes, examination and admission. The complete date sheet has also been released for the exam. Apart from the online mode of the exam, the other new thing about JEE Advanced this year is the increase of supernumerary seats for female candidates up to 14%to promote participation and admission of qualified female candidates. This decision is to ensure that the female ratio of students in the IITs increase from 2018 onwards. 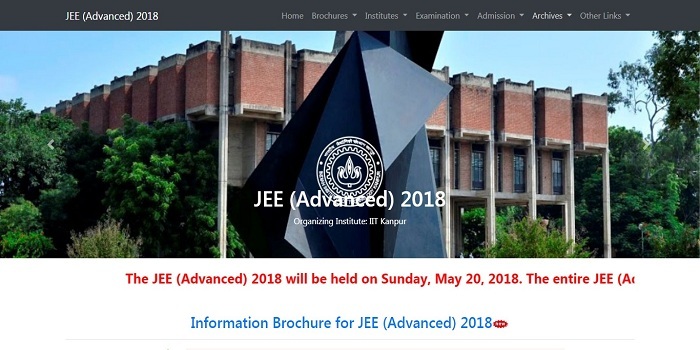 JEE Advanced 2018 is being conducted by IIT Kanpur on May 20. This time the test will be a computer based one owing to the printing mistakes and such that were associated with last year’s exam paper. IIT Kanpur has also released a mock test to enable students to get familiar with the online pattern of the exam. JEE Advanced Important Dates: Candidates can register and fill the JEE Advanced application form from May 2 to 7, 2018. They can also apply with a last fee of Rs 500 till May 8 in case they miss the regular deadline. The admit card of JEE Advanced 2018 will be available for download from May 14 till 20, 2018 which is the date of the exam as well. The results will be announced on June 10 while counselling will be tentatively held from June 19 to July 15. Eligibility & participation: A total of 2,24,000 candidates will be eligible from the JEE Main qualified candidates to appear for JEE Advanced 2018. Such candidates must have met the cutoff issued by CBSE to be eligible for JEE Advanced. It is also advisable for students to check whether they meet the prescribed eligibility criteria as they may face problems during the admissions if they fail to meet any one of the eligibility parameter prescribed by IIT Kanpur. The details of the JEE Advanced eligibility can be checked here. Application form of JEE Advanced: Candidates will be able to register using their JEE Main registration / application number from May 2 to 7, 2018. Any student who has missed applying between these dates can apply by May 8, 2018 on payment of a late fee of Rs 500. JEE Advanced Admit Card: Applicants can download their admit card from May 14 to 20, 2018. They must check all details after downloading and keep a saved copy for future reference. Result of JEE Advanced: The result of the candidates who appeared in JEE Advanced will be announced on June 10, 2018. The JEE Advanced 2018 answer key will be released on May 29 while the responses of the candidates will be mailed from May 22 to 25, 2018. The counselling for JEE Advanced will be held through JoSAA and will be held from June 19 to July 15, 2018.